Couple of weeks ago, I went beauty shopping “again ” 😛 but I’ve decided to divide my posts into three. This will include a quick product review as well. Face tools that I recently purchased and immediately fell in love with. I am going to try to make this post short and hopefully fun at the same time. So! let’s get started. I purchased two more brushes and they are the Deluxe Powder brush and the Smooth Coverage makeup brush. 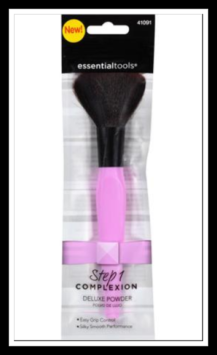 The Essential Tools Step 1 Complexion Deluxe Powder Makeup Brush is one of the essential tools for a perfect complexion. Use with powder for overall coverage. The silky-smooth bristles distribute makeup flawlessly. The easy-grip handle helps you to hold the brush comfortably for a precise application. First, cover imperfections (a concealer brush works great). Then, swirl the deluxe powder into loose or compact powder. Sweep and blend in a circular motion all over the face and decollete to create an even, smooth finish. Next, you’re ready to define your eyes with an eye shading brush. The Essential Tools Step 1 Complexion Smooth Coverage Makeup Brush is one of the essential tools for a perfect complexion. Use with liquid or cream foundation and BB creams for buildable coverage. The easy-grip handle helps you to hold the brush comfortably for a precise application. First, cover any imperfections using a concealer brush. Next, create a smooth complexion with a smooth coverage brush by blending desired liquid or cream over the entire face. Next, use a powder brush with loose or compact powder to set your makeup for flawless coverage. Another product that I purchased and became obsessed with right away is the EcoTools Pure Complexion Facial Sponge. The EcoTools Pure Complexion Facial Sponge is handmade with 100% natural ingredients, including konjac vegetable fiber exfoliating bamboo charcoal. What is a konjac? A highly renewable perennial root plant mostly comprised of starch (similar to a potato). It grows in warm climates including Japan, Korea and Southeast Asia. Aside from being used in sponge products, it is also used as a vegan alternative in foods. Get a better clean by removing impurities and revealing smooth, refreshed skin–just add your favorite facial cleanser and water. Wash away dirt, oil and makeup, and leave skin glowing without over-drying or causing redness. Sponge is gentle enough to be used morning and night. For best results, use sponge daily. After each use, simply rinse sponge with water and lay flat to air dry. Taking care of your sponge will help it last longer. Replace every one to three months.